The Nets were unable to gather a win against the LA Clippers Saturday night as they lost for the 4th time in their last 5 games. They would look to win against the Miami Heat on Tuesday. Both teams put up a horrible offensive showing in the first quarter. Brooklyn shot 28.6% from the field while Miami shot a measly 20.7%. Nets assistant coach Jordan Ott told Michael Grady “We’re kinda missing Caris tonight,” and that was evident. The Nets scored their season low of 39 points by half time, and as they fought through the offensive atrocity they closed the first half trailing by 3 (42-39). Though D’Angelo Russell opened the first quarter with back to back treys, he hit a slump early on in the game; but as the 2nd half was underway he began to find his rhythm. Late in the 3rd quarter he scored 12 points, grabbed 7 boards, and dished out 6 assists. Though his offense wavered he found other ways to be instrumental on the floor. Jarrett Allen continues to show consistency on the defensive end. 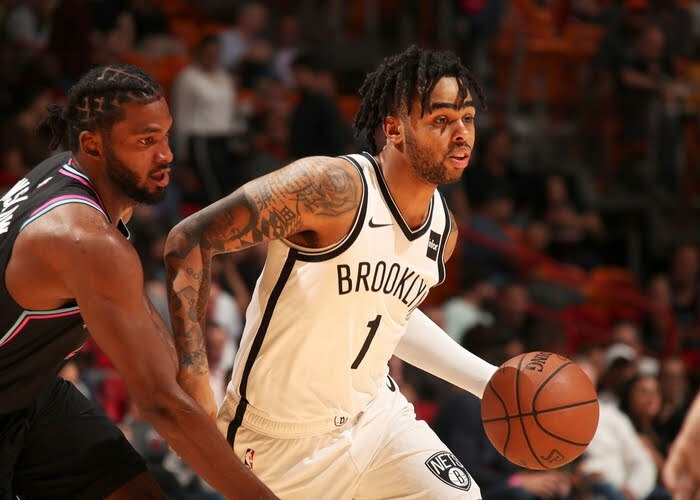 Brooklyn outscored Miami by 15 points (30-15) in the 4th quarter; as The Nets went on timely runs late in the 4th, the Heat were unable to recover. The Nets defeat the Heat 104-92. The Bench was on Fire! !- Spencer Dinwiddie finished the game with 16 points, and 7 assists, DeMarre Carroll added 11 points, while Ed Davis and Rondae Hollis-Jefferson combined for 19 points and 15 boards. Kurucs Remains Benched! !- The young player has shown promise for the team, however he remains left out of the rotation for yet another game. He fits the small ball style that the Nets so often execute, but yet he sees little to no minutes. Russell Is a Closer! !- “I consider myself one of the closers on this team,” said Russell. “D-Lo” scored 8 straight points late in the 4th, sealing the win for the Nets. Though it was a slow start, he finished 20 points, 9 rebounds, 6 assists and career high 4 steals. The Fro Rolls On! !- Jarrett Allen continues to show his presence down low. He recorded his 6th double-double of the year, finishing with 13 points, 14 boards and 2 key blocks. The Nets will continue their road trip with a back to back game, as they take on the Dallas Mavericks Wednesday night. Im a Brooklyn girl, born and raised; Journalism and Media Studies major; With goals of bringing basketball to the masses.